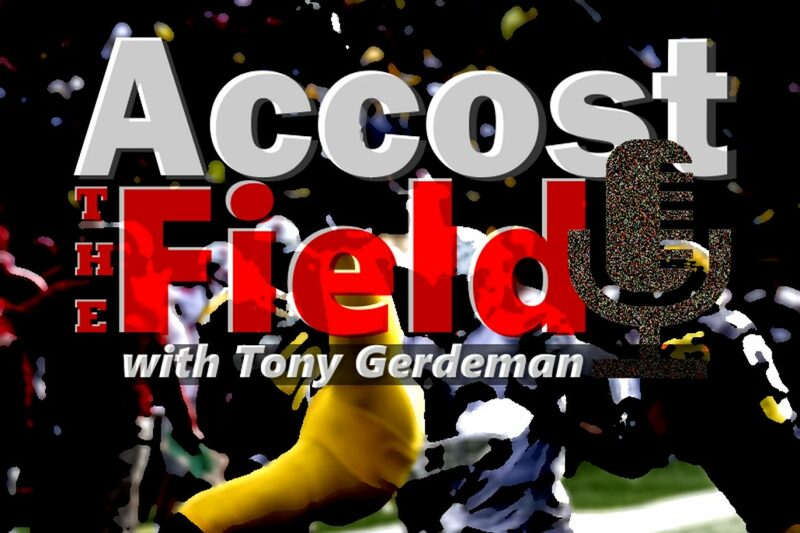 In this episode of Accost the Field, Tony Gerdeman and Tom Orr shift the focus from Joe Burrow to Dwayne Haskins. What does this mean for Ohio State moving forward? How will the Buckeyes attack defenses differently now? Are we looking at two 1,000-yard rushers this year? Is this the beginning of OSU becoming an NFL quarterback factory? All of this and much more, including a review of Episode 5 of All or Nothing, as well as listener questions. + Last week was the Joe Burrow show, this week is the Dwayne Haskins show. + Will we find out whether it was the receivers or J.T. Barrett who held the passing game back last year? + The 2018 season is a science experiment in the passing game. + Where will we see the most improvement in the passing game? + Last year, J.T. Barrett didn’t always trust something and the coaches didn’t always trust him. + Dwayne Haskins trusts his arm, but can he trust the receivers? + What this means for the running backs. + Will Tate Martell’s 9,600 yards rushing impact Mike Weber and J.K. Dobbins this year? + It’s all up to Tony Alford on who carries the ball when. + We will see two 1,000-yard rushers, right? + Urban Meyer says the offense will attack defenses differently now. + Which area of the field will be opened up most by this new attack? + The arm is bigger at quarterback, but are the receivers there to make the catches down the field? + Is the deep threat more of a concern than pass protection this year? + Who are the deep threats on this team? + The differences between the X and the Z in the deep game. + Will Dwayne Haskins soon allow OSU to tout the their ability to produce NFL QBs to recruits? + Dwayne Haskins is the most “prototype” NFL QB Urban Meyer has had at Ohio State. + A brief rant on Ohio State not taking enough Ohio kids. + The complaints have gone 180 on the quarterback run. + Dwayne Haskins runs well enough. + Is Dwayne Haskins more one-dimensional than a dual-threat quarterback who isn’t a great passer, like a Braxton Miller? + What combination is preferable — a great passer who is an okay runner or a great runner who is an okay passer? + If you want Joe Burrow to have a better year than Dwayne Haskins, you are a bad fan. + Tony preempts Tom’s typical lectures to him about the internet. + A Joe Burrow fan says hello to the Haskins train. + How can people be so definite that they are right and the coaches are wrong about Joe Burrow? + Tom lectures Tony again about the internet. + There is so much John O’Korn in this episode, but what were our favorite parts? + It looks like the players started to tune Jim Harbaugh out last year. + The most intimidating road game for Ohio State this year. + Who would be our picks to be OSU’s next head coach in five years? + We put together the starting 11 together for the Buckeye defense. No ors. + Is there a place for Dante Booker on the 2018 defense? + Where does Branden Bowen fit in with the offensive line this year? As you are aware, we are now on iTunes. Please rate it and review itso that more people can see us there. As always, we’re on Google and you can download this show from Spreaker as well. Agree with everything you said, Andrew… and it seems you agreed with me as well. Unless you misread my comments, we’re on the same page. Shoulda kept Burrow. May 17, 2018 by Dave R.
Burrow is the better QB and should have been the starter. I like Haskins too, but as Andrew said, Burrow is the better leader by far. It’s a shame Burrow didn’t stick around (although I wouldn’t have either), because then the Buckeyes would have two outstanding QB’s. If Haskins goes down, I’m not sure Martell is ready to play at a high level. The next head coach in 5 years will still be Urban Meyer. And why are some fans so sure that the staff made a mistake with Haskins over Burrow? The same reason they (me included) the staff made a mistake choosing C Jones over Barrett at the beginning of the season 3 years ago. Yes, Jones won a Natty and he should never pay for another meal in C-Bus. But then choosing him to start over J.T. the following September was a mistake that most fans recognized… as did the staff a few games into the season. Same thing here with Haskins and Burrow. Disagree Randy. What was obvious with J.T. is the same as what’s obvious with Joe over Dwayne – Joe is the better leader. I’m not a ‘bad fan’ wishing for Dwayne to fail but Joe Burrow is the better QB until Dwayne learns – if ever – to be a better leader. His interviews all sounded ‘me first’ where Burrows were polished and team-oriented. I wish Dwayne all success, I just trust my eyes and ears that Burrow was better. My thoroughly non-professional evaluation is that the Buckeye pass game will pick up some but there will also be more INTs and a bit more inconsistency – when it’s working it will be stupid-good, but when it isn’t we’re going to see a close loss or even a couple and the POSSIBILITY of another Iowa. We have new linemen and the last really good WR we had was Devin Smith – no offense to Michael Thomas who’s having an eye-popping NFL career so far, but he wasn’t all that with the Scarlet and Grey. Dixon and McLauren COULD make that leap but so far, nope! We also have no idea at all what the defense will be capable of outside of the line, that will help mask mistakes by the back 7 until we play someone good. Looking forward to the season as it’s gonna be a fun ride!